In general, binary options can be traded with 2 choices, namely up or down. The simple way of trading has now been developed into various types of trading. Basically, each different type of trading is determined in pairs. Some types of binary options commonly found are high / low, touch / no touch, and in / out. To estimate price fluctuations, ordinary traders use high / low trading types, while touch / no touch is used to analyze untouched or untouched price levels. Another type of trading, in / out, is done by setting limits to estimate whether the price will be inside or outside of that limit. However, the trading conditions for each type of trading above are not always the same in every binary options broker. Each broker usually has restrictions, variations, and special provisions for each type of trading he has. This article will discuss further about high / low options as one type of trading that has special variations. The type of high / low trading is chosen in this discussion because of its ease of use and trading character which can be said to be the basis of binary options trading itself. Therefore, it is not surprising if this type of trading can be found in all binary options brokers, although it may have different names and variations. What is High / Low Options? High / low options is a type of trading in binary options that is run by estimating the fluctuation of the price of an instrument. Because the movement here will bring the price to a higher or lower level than before, then the term high / low is very suitable for this type of trading. Here, traders benefit from predictions of correct movement. For example, when the value of the EUR / USD pair is at level 1.31171, the trader can choose the option "call" if the value is expected to rise, or the option "put" if the next move is predicted to fall. Of course, the expected movement has a time limit, or what is usually called expiry time. In this way, the price stike is not taken from the market price, but is determined manually by the trader. If you choose this type of high / low, the trader needs to do additional analysis of the reference price which can be the determining level of price fluctuations. 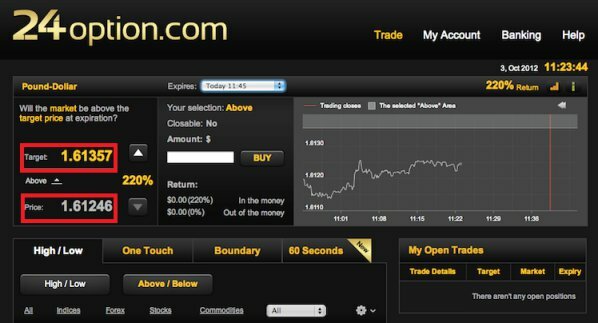 However, not all binary options brokers provide this type of trading. Even if it has a high / low variation with an arrangement like this, brokers often display it with another name. The aim of this is to make it easier for traders to recognize the differences between ordinary high / low types and this variation. Binary.com for example, provides this type of trading with a higher / lower name, while the type of high / low trading is usually called the type of trading rise / fall. This type of high / low has a strike price determined by the broker. Not all brokers provide this high / low variation. There are also brokers who can set the strike price for high / low trading types, and call it above / below options. Here, the trader can determine the price fluctuation of the reference level that has been automatically determined by the broker. The price target set above the market price can only be traded with the "above" option, while the available option for the target price below the market price is only "below". On the trading platform, you can determine your own strike price as a benchmark price of up or down movements. Even though the EUR / USD value is currently at 1.2469, you are free to set the strike price at a level higher or lower than that price. For example, you set the strike price at 1.2473, and then choose a "higher" option to estimate the increase above the strike price level in 20 minutes. If then the price moves above the strike price of 1.2473, your option will end in-the-money. Conversely, if the price is still at a level lower than your strike price in the next 20 minutes, then that option can be said to end out-of-the-money. Binary.com calls this high / low variation a type of higher / lower trading, to show the difference between this type of high / low trading and the standard type whose strike price is determined by the market price. Higher / lower here at the same time marks the estimate for the price that can move 'more' higher or 'more' lower than the strike price determined manually. On the trading platform above, it can be seen that the market price for the GBP / USD pair at that time was 1.61246. The strike price determined by the broker as the target is 1.61357, or higher than the current market price. Thus, you can choose the "above" option if you are sure that the price will go up to that level before the expiry time ends. However, if the broker's target price is lower than the current market price, the option you can choose is "below". That is why, this type of high / low is referred to as the trading type above / below. 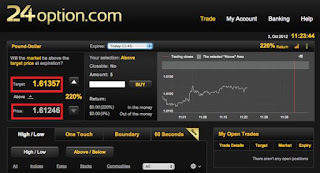 Each binary options broker has different conditions for each type of trading he has. The types of high / low trading and various variations are inseparable from that. However, the most common type of high / low trading, which uses strike prices from market prices, usually does not have a specific provision from the broker. 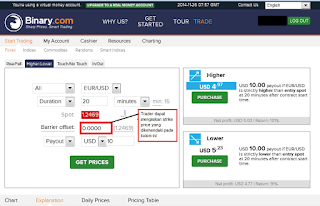 This is fairly reasonable, because this type of trading is indeed the basis of binary options trading itself. The type of high / low strike whose price is not determined by the market price has several special conditions, restrictions, and features. For example, for higher / lower types of trading on Binary.com the minimum expiry time limit is different from expiry time on other types of trading. If the type of trading high / low standard (rise / fall on Binary.com) can be run with a minimum expiry time of up to 1 minute, you will only get a minimum of 15 minutes higher / lower. In addition, this type of higher / lower trading also does not have a "Start Time" facility that allows you to hold the opening of option positions within a certain period of time. 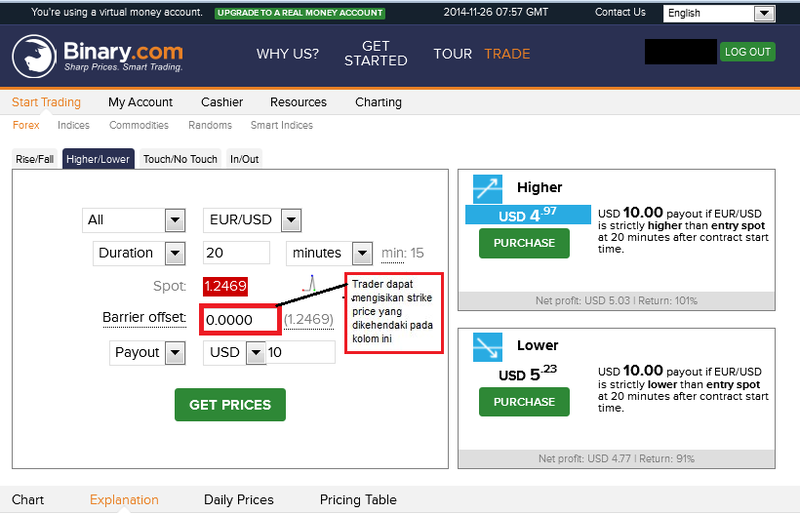 This feature specifically exists only in trading rise / fall types at Binary.com brokers. Conversely, the type of trading with the strike price determined by the broker is actually facilitated with a very high return profit. Even though you cannot determine your own strike price with this type of trading, you will get a profit return of up to hundreds of percent. This is certainly very profitable, because the maximum return profit for ordinary types of trading does not reach 100%. However, this type of trading can only be carried out when market volatility is high. Usually, a new broker will open access for this type of trading at 17.10 WIB, or about 3 hours before the opening of the New York market. 1. Trading becomes easier because you don't have to bother putting up a stop loss or take profit level. By setting the strike price, direction of the option, and expiry time, the position of your trading option will be executed automatically. You do not need to worry about trading positions that are floating or the balance of trading is running low. All of that can be arranged in advance through money management which is applied to capital calculation and return profit. 2. Trading psychology will be more awake, because you will not be able to change the position of an option that has been previously set. Whatever happens, the option position will continue to take place according to your option order until the expiry time is up. However, that does not mean you cannot cover losses on options that seem to be ending out-of-the-money. There are many strategies in binary options, including hedging, which can anticipate the loss of your binary options trading. 3. This type of trading can be applied to all market conditions. Both for uptrend, downtrend, or sideways, high / low options conditions and some variations can still be used optimally. Of course this will require a special trading strategy. But with the expiry time option, you can still reset the trading strategy so that your option position ends in-the-money. 4. With high / low options, you have the opportunity to earn profits in a short time. If you are interested in utilizing an offer from a binary options broker to trade with minute expiry time, you can take advantage of a 60 second to 15 minute strategy, which is structured to estimate price fluctuations in just minutes. Some binary options brokers are very specific in determining the return profit and expiry time for each type of trading they provide. What you can get from one broker, you might not get at another broker. However, each broker must provide special features that can help your binary options trading. Therefore, you must really understand every detail of the trading system and the features offered by your preferred binary options broker. In this case, you can compare several brokers to get the best trading services. Good capital management will help you maintain a healthy trading account. This can be done by limiting the use of capital, as well as measuring the percentage of return profit on each option position. Each broker usually has its own policy in providing payout and sets a minimum limit for capital trading. For this reason, these two things should be taken into consideration when choosing a good binary options broker. Some variations of high / low options have a higher risk than the type of high / low itself. For example, the type of trading above / below usually has a smaller profit percentage than the type of high / low bias trading, because it can only be done when market volatility is high. In addition, the choice of assets in this type is also more limited. However, with profit returns reaching hundreds of percent, these limits will not overload the trading system, especially if your option ends in-the-money. Before actually using real money on this type of trading, practicing on a demo account will provide a valuable experience to deal with trading difficulties on a real account. You need to practice and get used to using this type of trading before placing an option with real money. This will prevent some losses that can be caused by ignorance and unpreparedness in dealing with the market in this type of trading. With the ease and several variations that have been developed from high / low options, this type of trading can be utilized by both newcomers and those who have long been in the world of binary options. The selection of suitable binary options brokers will greatly help the success of traders with this type, given the variety of high / low options are also accompanied by special provisions that need to be considered so that trading runs successfully.